What with family hikes, trips to the farmers market and corralling their Great Dane, this active family of four needed a home with durability and functionality in mind. 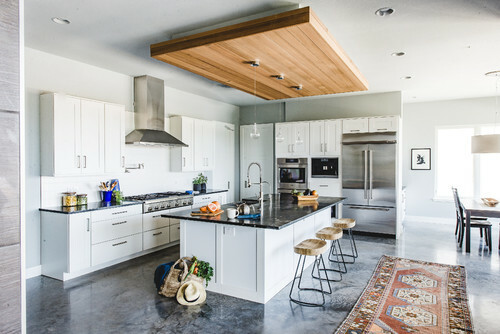 Designing and building a new home ensured that they would get everything they wanted, including an open, simple kitchen with a concrete floor and a quartzite countertop that can take the daily traffic. “We wanted every surface to be easy to maintain,” says interior designer Laura Burton. The home’s flow maximizes the abundant light that floods in from a long wall of windows. During the day, the overhead lights are rarely needed. The homeowners love good food and good coffee, so a built-in Miele coffee machine and Bosch appliances were a priority. A large walk-in pantry anchors the corner of the kitchen. 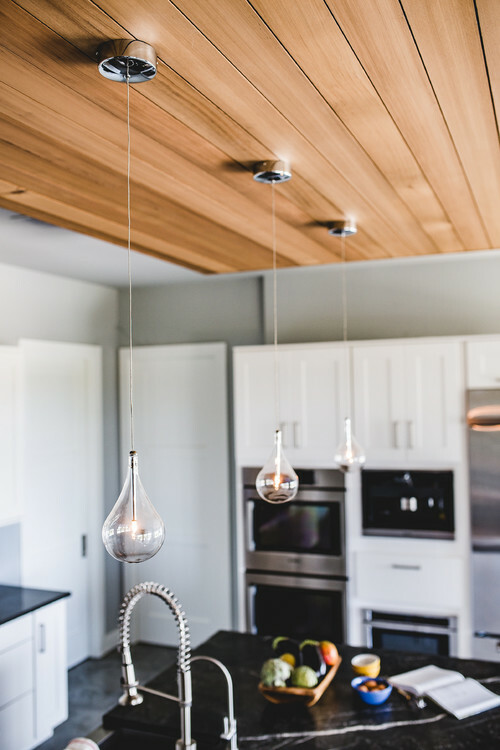 Clear glass light fixtures in a teardrop shape provide a subtle accent over the island without distracting from the clear cedar soffit. “The soffit was added for warmth,” Burton says. The wood also offers a bit of color to the mostly white-and-gray scheme. 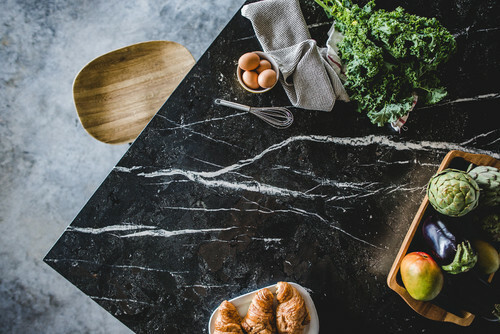 Saratoga quartzite lends interest to the island, which functions as the hub of the home. Healthy meals are frequently prepared here as the girls sit on the stools and do their homework. The stained-concrete floor handles life with two young kids and a large dog. For the walls, gray paint with a hint of blue picks up the tones from the floor. An antique Turkish runner mimics the hues in the soffit, contributing warmth and charm. 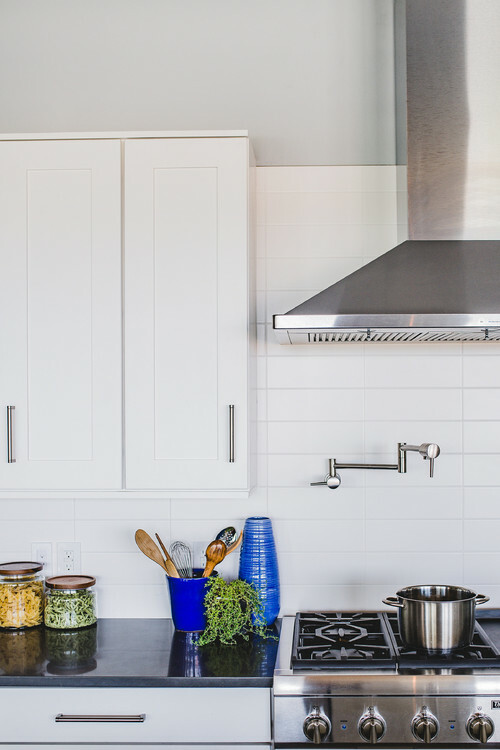 Elongated white subway tile in a stacked pattern establishes a modern-style backsplash that offsets traditional Shaker-style cabinets. 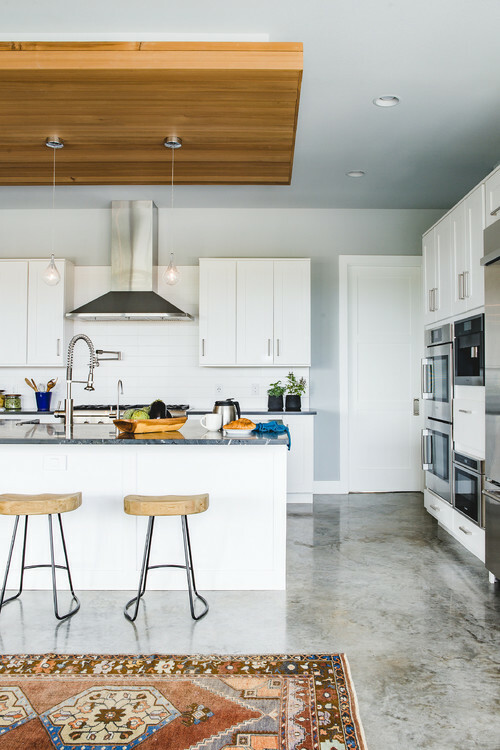 “The kitchen really represents this healthy, connected family,” Burton says.